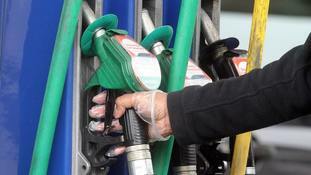 The average cost of a litre of unleaded now stands at more than £1.30. The price at the pump rocketed by 6p a litre, meaning it now costs £71.18 to fill a family car, figures show. National Energy Action says its report highlights "the scale of the impossible choices over a million families will be making this winter". Filling up a 55-litre family petrol car is now on average £9.53 more expensive than a year ago, with diesel vehicles costing £11.69 more. Britons have been left stranded in France after running out of fuel due to shortages caused by an industrial dispute. The new report by Oxfam claims that even if governments meet their climate and energy commitments for 2020, Europe's annual energy imports bill will soar from £325 billion to more than £400 billion by 2030 because of rising prices. At the same time the EU's food import bill could rise as climate change hits countries where much of the bloc's food is produced, the report said, leaving Europe's poor struggling to pay for both heating and food. European countries must work to stop their "dirty energy addiction" and seek alternative fuel sources or the poorest members of society will pay the price, Oxfam have said. Oxfam's campaigns and policy director Sally Copley said: "Unless Europe acts now to break its addiction to dirty and costly fossil fuels then both Europeans and the world's poorest will pay the price. "It's in all our interests for Europe to end its reliance on dirty imports and instead develop clean, safe and affordable energy at home." Oxfam is calling on Europe to agree an energy and climate change package of measures for 2030 that commits to energy savings of 40%, emissions cuts of at least 55% and boosting sustainable renewable energy to 45% of the energy mix. Europe imports half its energy, predominantly fossil fuels - and Russia is the EU's top supplier for both oil and gas, with European countries paying more than £200 per person to Russian oil and gas giants last year, Oxfam said. The turmoil in Ukraine should be a wake-up call for Europe's looming fuel and food crisis, campaigners have warned. Ahead of the G7 summit, organised by leaders after they decided to boycott a planned G8 summit in Russia this week, Oxfam said tension with Moscow over the situation in Ukraine highlighted the need for Europe to reassess its energy mix. One the UK's key underground pipelines has been shut down as police investigate whether tens of thousands of litres of fuel have been extracted from it. It is understood that detectives are investigating whether the 30,000 litres of fuel was extracted from a pipeline running from the Esso refinery at Fawley. The Midline pipeline was built in the 1980s and runs underground carrying fuel through Wiltshire to the Midlands, including Birmingham International Airport.